I decided it was finally time to post a somewhat healthy recipe now that we’re in the second week of the new year. Greens are always healthy, and we’re told at every turn that we need to eat more of them. I like green leafy vegetables, but I cannot seem to eat them all the time and my biggest challenge is trying to fix them in different ways. There has got to be more ways than just sautéed greens with garlic. We eat a lot kale and usually, I like to bake kale chips first and then use them crumbled on top of soups and stews. I find baked kale chips texture more appealing than straight up stewed or sautéed kale. I like the chard too but can never get creative with them. I’ve curried them before and added them to stews but I’m never inspired. It’s a bit sad really because I see mountains of them in the farmers markets during spring and even the shops have decent bundles. The fresh, young spring greens are easy, because to preserve the flavour of the young tender leaves, we eat them in spring mix salads or toss them gently and stir fry. But then I lose interest. Every year, I promise I’m going to get inspired! I probably use spinach the most as far as greens go. It’s easy to have a box of baby spinach leaves in the fridge and they get tossed in smoothies, stir fries, salads and stews. One of my children’s favourite spinach dish is the Indian palak paneer; the creamy cheese spinach curry. 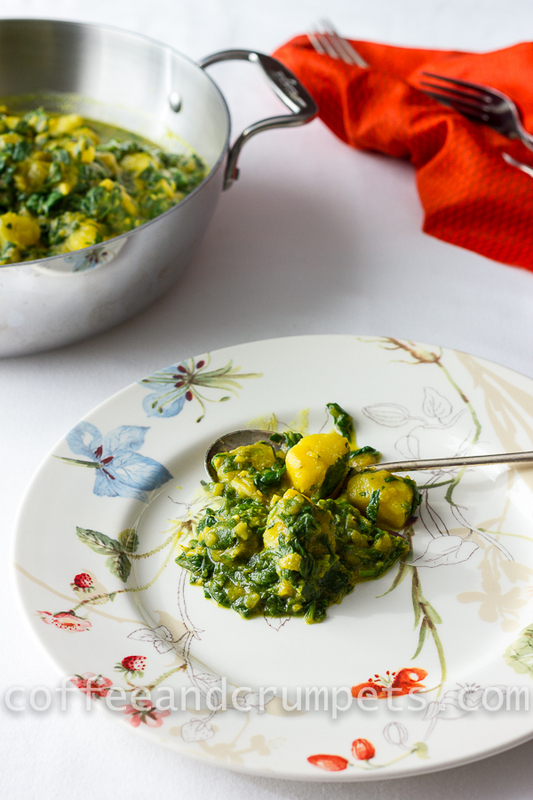 One of my favourites is the very simply prepared, lightly spiced, Spinach and Potato Curry, also known as, Palak Aloo. I hadn’t made this for a while and happened to have a box of baby spinach leaves that needed to be used up quickly. I didn’t want it too heavily spiced and wanted the fresh spinach taste to come through. I also love how the potatoes soak up all the slightly bitter and spicy cooking liquid. It had been a long time since I had made it and after enjoying it for dinner, wondered why I had forgotten to make it in so long. It is really good, and though some people traditionally eat it a lot drier, we like ours a little more runny so the delicious juices soak into the rice. The choice is yours, just let the curry cook longer allowing the juices to evaporate. I don’t like the spinach to cook too long. As soon as it’s wilted and a little bit of the water has evaporated, I pull it off the heat. This a way, the spinach still retains it’s goodness and is a vibrant green. Frozen spinach can be used with great success but this particular curry has a totally different taste with fresh spinach so I recommend using fresh leaves. Sometimes I add a few dried fenugreek leaves. If you haven’t tried this green, it is widely used in Indian cooking and has a pleasant bitter taste. I absolutely love the fresh leaves but they are not always easily available. Many Indian cooks keep dried leaves to add as a herb or spice. I feel the dried fenugreek leaves enhance spinach’s bitter qualities in a pleasant way. It’s also adds more depth to the dish but on days I just want to taste the fresh spinach, I leave it out. I have it as an optional ingredient if you’d like to try it. Fresh spinach and potatoes sautéed with onions and warm Indian spices. In a large pot, heat the oil on medium heat and brown the onions. Once the onions are lightly browned, add the garlic and ginger paste and cook for a minute until fragrant. Add the potatoes and toss in the oil and onions. Add the turmeric powder, ground cumin, ground coriander and red cayenne powder. Mix through into the potatoes. Allow the potatoes to sauté for about 5 minutes. Add enough water to cover the potatoes, cover and let potatoes cook, about 10-15 minutes. Once the potatoes are just tender, making sure there isn't too much water, add the spinach leaves and cover to allow spinach to wilt. The spinach leaves will release some water so you don't want too much water in the pan before adding the spinach, about a cup and half of water is acceptable. Once the spinach has cooked down and beginning to get tender, uncover and evaporate some, of the water. Add the green chilli and the fenugreek leaves, if using. How dry you want the curry is up to you. Since my children like rice with theirs, I keep it a bit fluid as you can see in the photos. If you like the curry drier, then add the spinach leaves when there is barely any water left after the potatoes are done. Serve as a side with rice or bread. I love your photos Nazneen – so clean and colourful. You’ve inspired me with your idea of sprinkling kale chips over food. To be honest I think they are a pain to eat – they always seem to get stuck in your teeth and it looks like you have moss growing in-between!!! Or is that just me? In any case, this is a reminder I don’t have enough curry in my life right now. Looks fantastic Nazneen – I love curries, and spinach and potato combos are one of my favourites. I haven’t actually had a curry since I came to Sweden… we used to eat them quite a bit in France. You’re making me hungry! Thanks Charles! This is definitely a good one, simple but filling and total comfort food. It’s easy enough to make so get in there! I can’t wait to try this? It looks so delicious! Regarding the Swiss Chard, try sauteing it in garlic and olive oil. It’s really great that way, especially with a poached egg on the side. Thank you! I hadn’t made it in ages either and when I did, I was like why did i wait so long?? I am not sure which I love more…the pictures of this dish or the story and step-by-step instructions! This looks beautiful, and refreshing. Love your shots. Methi adds the punch and I always add some, preferably fresh or frozen. I have even tried adding kasoori and that works too. Spinach is by far my fav green too and I am cooking with some tonight. I always have kasoori so i use that. I can’t always get fresh here but I love fresh methi.Thanks Minnie! This looks really good. I’ve tried Palak Paneer in an Indian restaurant and I loved it. I just don’t know where I could buy paneer. This also looks like something I want to try. Paneer is easy to make if you want to try it. Just a matter of souring milk and scooping the curds out. If you want to try an easy version without paneer, just make this! Thanks Peachy! Shashi @ http://runninsrilankan.com recently posted..Oatmeal Pancakes! Thanks Shashi! I love methi and spinach too, I think its comfort food for most SE Asians. This does look so healthy and perfect with rotis. I’ve been eating a bit healthier too after a cookies and cakes(which we enjoyed). I bake kale too and use it on soups and salads, tastes so good right?.. Btw, the curry does look yum. Pinning. Hi Nazneen, The spinach and potato curry is looking terrific! It’s wonderful to see your each and every post. I simply adore your work ! And hope to see more of your creative endeavors soon ! Bookmarked this one and shall give it a shot :)) Wish you and your family a very Happy and Blessed New Year!!! sonia recently posted..Umpteen Best Wishes for the Year 2014 and Redefining Self ! This is one of my favorite dishes! And I usually make it with chard rather than spinach – I think it works really well, but maybe it’s the way I season it. If you haven’t tried chard in this dish, it’s worth a try IMO. Anyway, great dish. And so pretty! Thanks John! Yes, I’ve tried it with chard and also the chicken version with chard too. I find that greens tale vey well to Indian flavours and sometimes it’s the best way to jazz em up! Nazneen, this dish is beautiful. And with all those flavors I must try this one soon. Pinned. This looks sooo good, Nazneen! Anything curry and with potatoes gets my attention. I really like your loose curry. The thought of that sauce running into some rice underneath makes for a sensational meal. I am craving this right now! Came over to say hello to my blog Neighbor! I live in Broomfield too. Met Lea Ann today and she mentioned your beautiful blog. We all are planning to meet soon. Hope you can make it to the local bloggy meetup !! I now know what I am going to make for dinner tonight! Am inspired, looks yummy! I would say this is second only to saag paneer. Looks great. Well, I do like artichokes! And this looks great because I love spinach and love potatoes. Plus, I have everything on hand in the spice department. What does fenugreek taste like? Should i get some? I’ve had this on Indian buffets, but this looks like way better! Thanks, Nazneen! Good morning Nazneen! thank you for this tasty recipe that will be my lunch today! Nazneen – this is so beautiful and comforting, and just the kind of meal we are all craving now. I think I will grate fresh turmeric into this, as I have some on hand. This will be a wonderful treat midweek for supper! Thanks for sharing! Can you share your palak paneer sometime, too? Do you make your own paneer curds? Happy weekend!